Sharing the Wellington Division was more fun than I expected and now that it's done, I wish I had another graphic novel to post. ...So I'm writing one. :) I've been thinking about this particular story idea for about a year, and unlike the Wellington Division, which was already complete when I began to share it, this comic will be posted page by page. I'm still polishing my outline/script, but in the meantime, here are a few character designs. There are several female characters in the story, and they need to look very different from one another. Thank you to everyone who has commented about the Wellington Division. I really appreciate all the feedback. I hoped to respond to every comment personally, and still plan to. Thank you for your patience. And thanks for making your way through all seven-hundred and sixty pages! So Excited! I'm glad your back! I was wondering where you went! I can tell this is going to be just as great as the last story! And Anonymous, that's awesome! I got a late introduction to the world of graphic novels myself. I always like comics sort-of, but it wasn't until a few trips to comic cons that I realized that comics didn't have to be just about superheros (as much as I like superheros) or have to be in a specific artistic style. Thanks so much, Sarah! :D I have to do some digging for that WD post. I know I have some other old art on my old servers too! Congratulations on completing the Wellington Division! And all the best for your new Story!!! Great news! Can't wait to see it. Sounds like you have a nice feeling of momentum coming off posting The Wellington division and getting such good feedback. Really looking forward to the new one! Sketches look great!!! I can't wait to see what comes next. 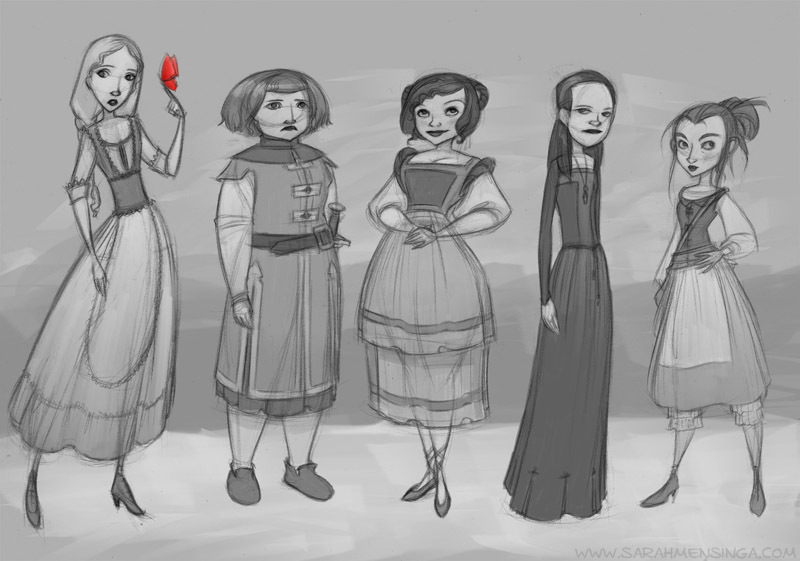 You did excellent making each girl look different in this sketch. That was always my problem when attempting a comic or graphic novel was getting my characters to be the same character in the next panel. Any advice ? Thank you so much, Laurent. Thank you also, scylla's revenge. And thank you dori, and feel free to ask anything you like. Hello! You have a new fan! I was first introduced to your graphic novel The Wellington Division by a friend and have since fell in love with your art style! It was definately something I looked forward to every monday--reading the next panel--and now that it's finished, I'm a little sad, but I'm glad you're starting another one! I look forward to it!